As a hill-goer, you may have heard of Lyme Disease, but you probably think it is rare, not serious and easy to cure. You'd be wrong, and here's why. RARE? Lyme disease is on the increase in the UK. The Health Protection Agency estimates there are 3000 new cases every year, and that is probably an underestimate. Every year, the numbers of confirmed cases rise. That's a lot of infected ticks out there waiting to bite you. The numbers of ticks are thought to be on the increase with milder winters killing less off and fewer sheep dip chemicals available to farmers. Mild, wet summers are perfect for them. In Scotland, a recent study tested ticks in 25 sites. This showed that ALL study sites hosted Lyme invested ticks complete with an infection rate of 1 to 14%. NOT SERIOUS? Lyme disease varies in severity enormously. In the UK there are at least 3 genospecies of Lyme, and probably about 400 different strains. In addition, there are several other diseases that the ticks often transmit at the same time as Lyme - Ehrlichiosis, Babesiosis and Bartonellosis are three of these that occur in the UK. These factors, together with the duration of infection before diagnosis and treatment and the state of your immune system in the first place, make it a lottery as to whether you get a mild case or a more severe case. Mild Lyme IS probably the majority of cases, but the consequences of getting severe Lyme are serious. 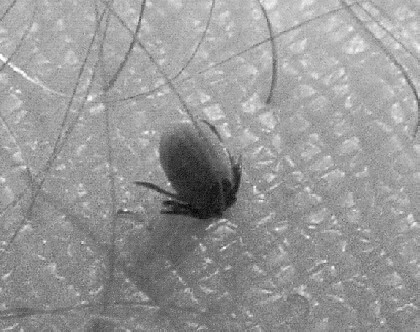 Symptoms usually appear 3 - 32 days after the bite of an infected tick but onset may be delayed and illness only appears months or even years later. EASY TO CURE? A short course of antibiotics and you'll be fine, right? It depends who you talk to. For early Lyme which hasn't spread to the nervous system, a short course of appropriate antibiotics at the correct dose probably does cure most people. However, Lyme that has spread to the nervous system or shows the symptoms of late Lyme, may not respond to such treatment. This is where you may need much longer and stronger courses of antibiotics. Some patients find they need treatment for many months or years before they are cured. Some people may never be fully cured. Most doctors in the UK are not aware of the need for such aggressive antibiotic therapy in these serious Lyme cases, and finding such treatment on the NHS is usually impossible. This is why you should check for ticks after every walk - remove them promptly with a tick hook or fine pointed tweezers (don't try to smother them, burn them or drown them, this makes infection more likely). Wear repellent, especially around the 'entry points' wrists, waist, ankles, neck. Avoid wading through bracken and brushing past vegetation if you can, don't wear shorts, tuck trousers into socks or wear gaiters, cover the heads of children (and check their scalp). If you suspect Lyme, don't delay. Inform yourself on the following websites and consult a doctor. Early stages: Flu-like illness (no runny nose, sore throat), general malaise, fatigue, headaches, aches and pains in muscles and joints, digestive problems, bullseye rash (less than 50% of cases), fever, persistent swollen glands. Later stages (may also occur early): 'Viral-like' meningitis, joint inflammation, nerve damage leading to pain and partial / (rarely total) paralysis, facial palsy (face droops on one side), loss of co-ordination, confusion and memory problems, difficulty thinking clearly, cardiac problems, tinnitus, visual disturbances, numbness, dizziness, vertigo, sleep disturbances, nausea, persistent headaches.